Be You, No One Else Can: Who has power - Technology or Society? 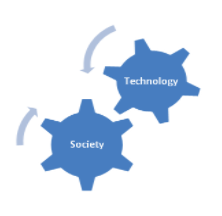 Who has power - Technology or Society? We explored some theories of the relationship between technology and society this afternoon. A thought-provoking question to think about is who has the power over the other - technology or society? I found this incredibly interesting to think about, and also quite scary. It frightens me how strongly people feel technology is 'taking over' society. How technology is seen to have power over our lives, and every aspect of our lives. Having this opinion and real fear, that technology is a controller of what people do, is referred to as technocracy. If people seriously deem this to be true, and see no place for technology in society, particularly education, I fear how disadvantaged these citizens, and potentially their children are. As discussed in the Horizon Report and the Future Focused Learning in Connected Communities, both forecasting what is to come in education, teaching and learning, a large component is the need to develop 21st century learners. I always wonder who determines what these are, and who determines a 21st century learner, but a huuuuuge aspect is the need to be comfortable, confident and connected digitally. After talking through the various groups of people/stakeholders and how they view the power relationship between technology and society, I started to think about how I feel, where I fit. I think I come under the 'soft technological determinism' notion. This is the idea that technology influences and is influenced by society. A mutual relationship, where one impacts on the other. The scary reality though, is what will technology be like in 2, 5, 10 years - who will be in power then?